My footsteps echo as I walk into Brent Lenehan’s garage in Alameda. Rows of new and old motorcycles sit in various states of assembly. Brent greets me and his voice booms in the huge space. What was once the local Chevrolet dealership’s service bay is now a place where he and his friends can indulge their motorcycle addiction without the mutual annoyance of wives, landlords or neighbors. 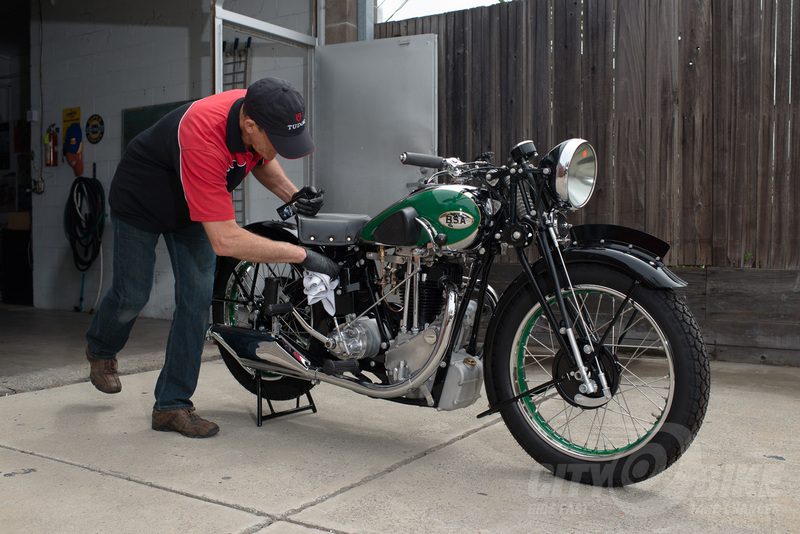 When I first visited him, he had just returned from the Quail motorcycle gathering where his just-finished 1936 BSA had won second place British bike among a crowded field. He’d found it in a rancher’s field in his native Australia, parked outside for over 60 years. Today it looks as new, in the stunning stock green and chrome finish. 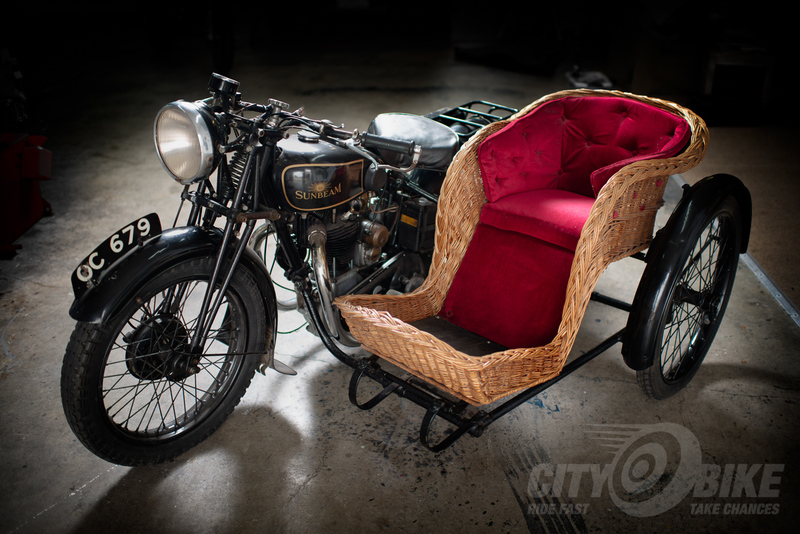 Beside the BSA sat an almost 100 year old Sunbeam with wicker sidecar. Mostly unrestored, it’s a charming sight. The black paint is aged and some bolt heads have gone rusty, but the elegant design and simple, bare mechanicals make it gorgeous all the same. It’d suffice as an art object but as with all these machines, it will be ridden. The bike I’d come to see might be Brent’s favorite of all. Off to the side, underneath a ghostly sheet, I recognize the distinctive shape. 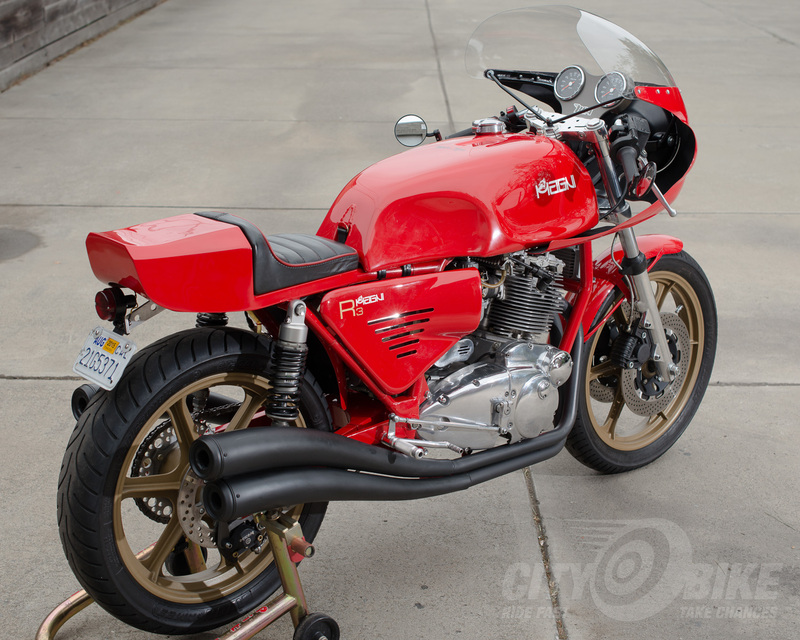 Brent uncovers the bright red paint and gives me the tour of his truly one of a kind Magni-framed BSA-powered Hailwood-era dream machine. 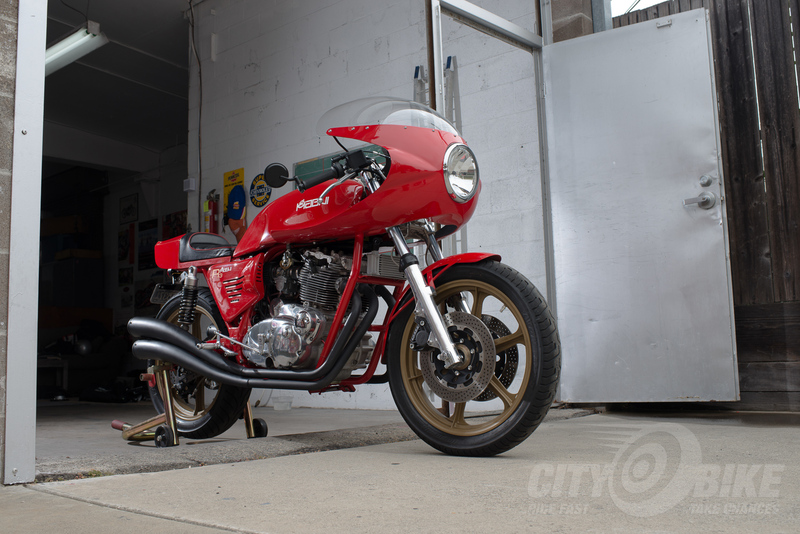 Nestled in the featherweight Italian GP replica frame is Brent’s favorite motor: a BSA Rocket triple, bored to over 900ccs and putting 90-ish horsepower to the rear wheel. With a wet weight under 400 pounds and a dramatically short 54-inch wheelbase, it’s a recipe for supersport agility and acceleration. 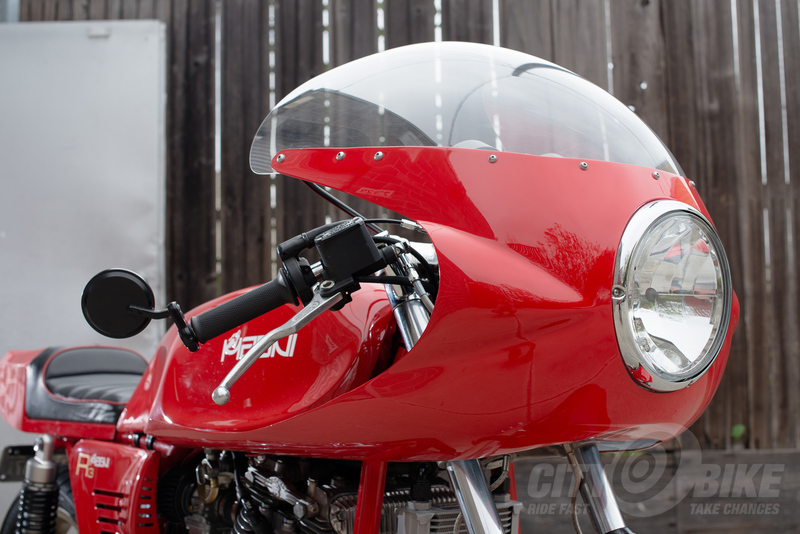 A little background—Arturo Magni was MV Agusta’s race department head through the 1970s with Hailwood and Agostini. Years later, he and his sons began producing new frames based on his years refining MV’s chromoly GP frames. 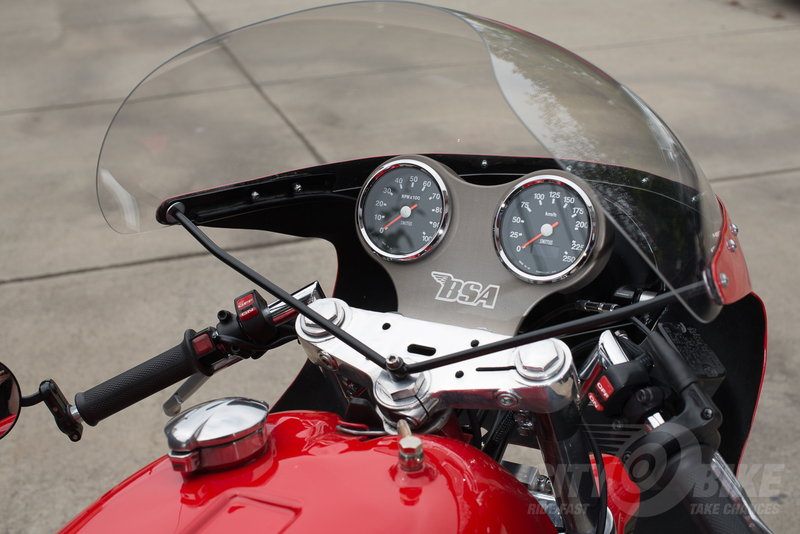 Over the years, customizers have stuffed different motors in, culminating with current plans to produce a limited run with modern Triumph 675 triples. But before Brent, there hadn’t been a British blend. 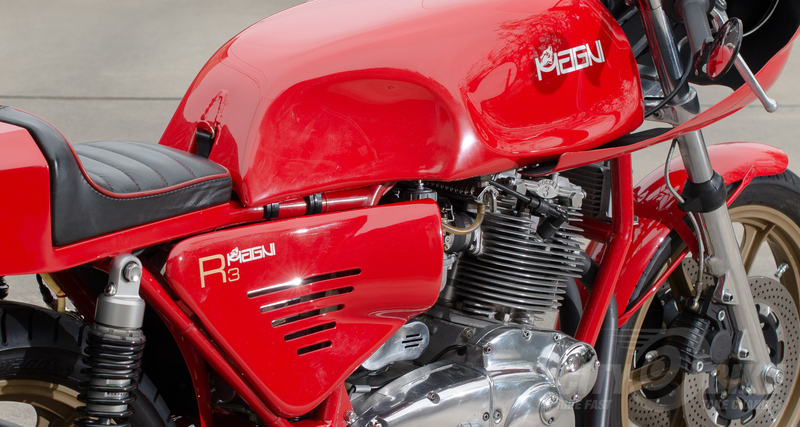 Brent enlisted the help of Jerry Liggett of Triple Tecs, one of the world’s top experts in building British triples. 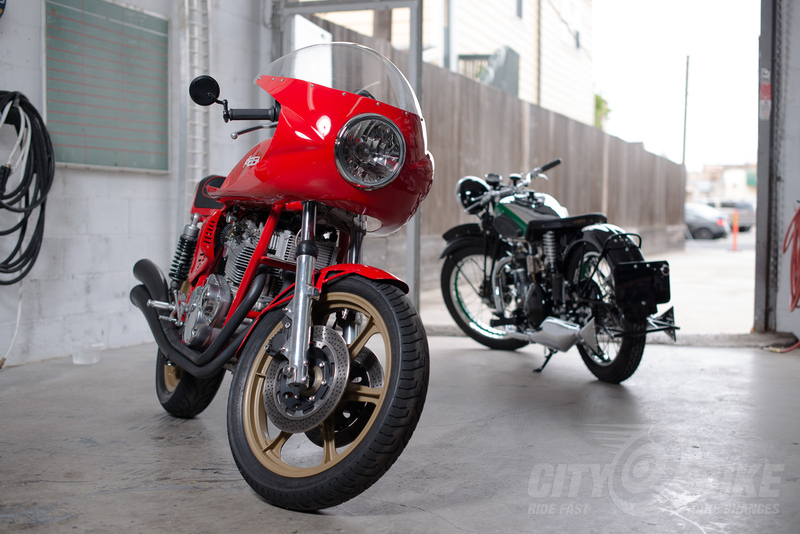 Brent had originally inquired about a street tracker build using the Rocket motor, but when talk turned to cafe racers and that beautiful Magni frame, they both agreed on the proper recipe. Jerry prescribed the additional bore, stroke, and strengthening of internal components, while keeping the tune friendly to pump gas. The goal was simple—Brent wanted the ultimate 1970s streetable triple. Aside from modern rubber, the bike was to be kept largely period correct. 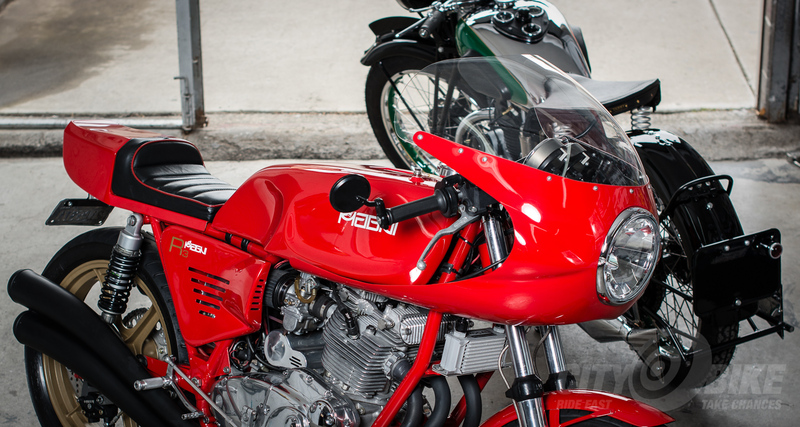 Blending the Italian and British parts turned out to be relatively straightforward—Magni created the required engine mounts, while Brent and Jerry made minor alterations to other factory pieces. Brent thumbs the starter and the motor barks to life, the loping idle reverberating off the concrete walls. 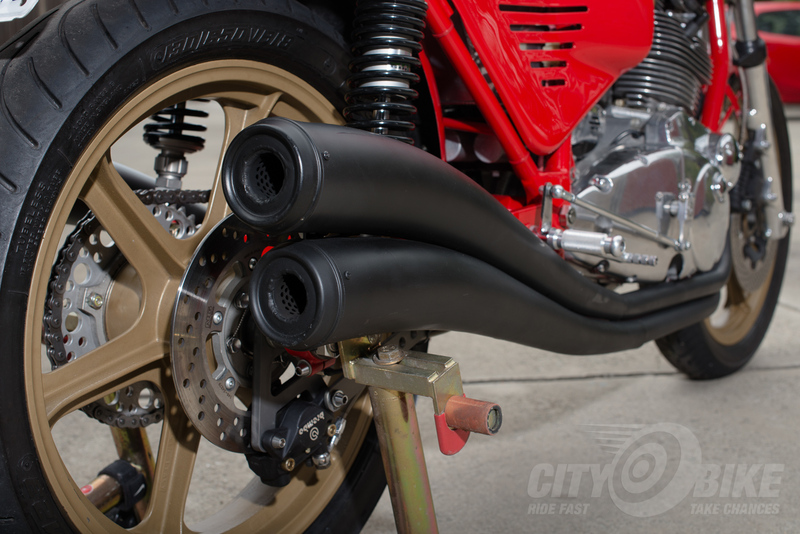 The hot cam makes it sound eager, and a quick rev of the lightweight flywheel affirms the notion. Brent suggests a ride. My eyes go wide. I had driven a hatchback loaded with camera gear here, but he offers a helmet and gloves. Do I dare refuse such a generous gesture? I quickly accept before I’ve thought it through and hop on his KTM 350 to follow him out of town. We stop near the airport and swap bikes. The warmed up motor sounds more vocal now—more urgent. Pulling away gingerly, I remind myself of the inverted GP shift pattern and Brent’s recommended 7,000 RPM redline. I short shift to third and cruise, getting a feel for the bike at speed. It is indeed as agile as it looks, but the ride is well damped and even feels fairly modern. Downshifts are a joy—toss the tiny flywheel with a breath of throttle and catch it with the slick-shifting transmission. The first few kinks in the road demonstrate the bike’s manic agility and I’m cackling in my helmet. Brent pulls in front and raises the pace a bit, up through the cogs again, this time to fourth. We pass beneath an overpass and I take the opportunity to crack the half-turn throttle wide and sample the soundtrack through the beautiful 3 into 3 swan-neck megaphones. The howl that develops in the midrange sends shivers down my spine and I start to sweat in my borrowed gloves. Letting the throttle close, the open-throat song turns to a more mechanical bass line. Squeezing the brake lever the forks compress just slightly and we slow smoothly. The bike is very stable, easy to ride—despite its instantly accessible potential. Precise is the word that comes most to mind—there is not one wasted motion in its action. Neither is there any imprecision to its aesthetics. Nothing about this bike is superfluous or sloppy. It is a perfect fantasy made physical. We pull a u-turn beneath another concrete overpass, over greasy dirt and broken glass. I can’t help but blip the throttle nervously, the bike almost anticipating my mood. We carve an arc as tight as Brent’s dirtbike and accelerate from just above idle. The bike pulls cleanly, torquey down low, with a linear build in power. It’s a very friendly, predictable motor that just happens to smoke crack cocaine. 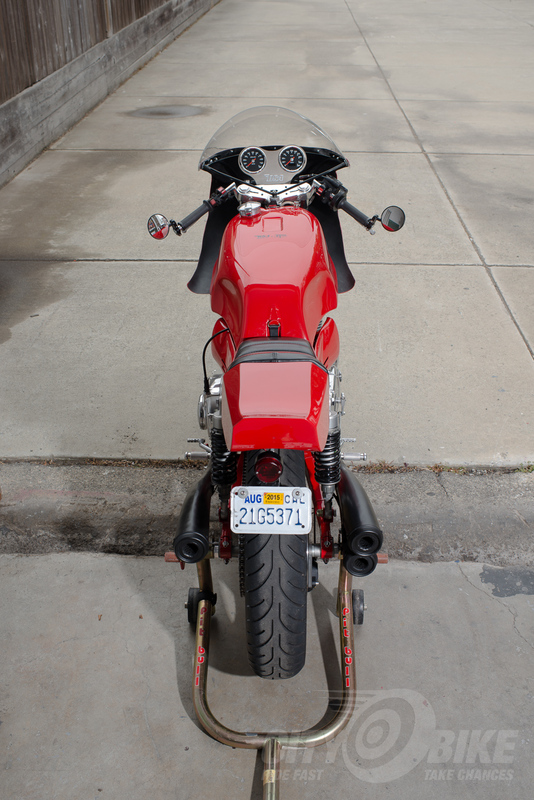 The bike’s light weight and short wheelbase mean that spirited acceleration is a thrilling and brief event. We climbed up three gears about as quick as a generation old supersport might, but with a bit more drama, and a lot more charm. Before we ride back, I’m treated to one more third-gear sweeper. Easing on the throttle, I hunch over the long, low tank and see exactly what’s so special about this bike, motor, and owner. This is the rare dream bike that rides as well as it looks, and manages to evoke classic heritage while carving a new history all it’s own. Ride on, Brent! Jeff is CityBike’s wandering photojournalist. 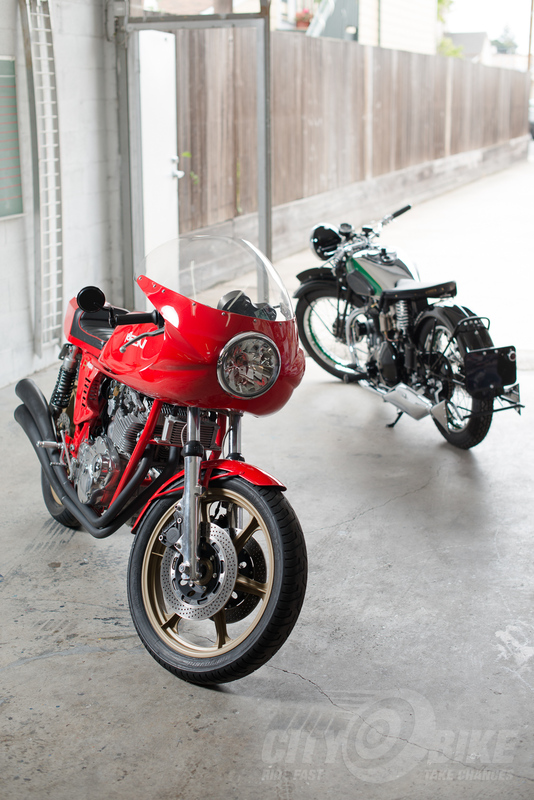 He recently replaced his 72,000+ mile SV with another SV, which he promptly replaced with a CBR600. So it goes. This story originally appeared in our September 2015 issue.